Your flutterpony character has several abilities that come as part of being one of the flutterponies. Age. Flutterponies mature at around age 10, much sooner than many of the other races. Alignment. Flutterponies tend towards chaotic alignment, but have no particular leanings between good, evil, and neutrality. Fey Born. 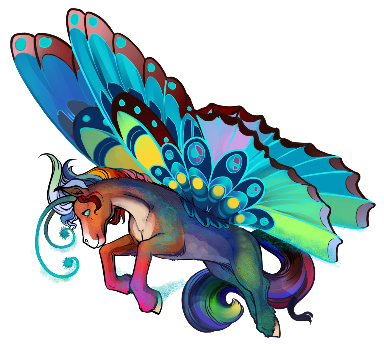 Flutterponies count as fey for all purposes. Four Legged​. Being a four legged creature, you can bear greater weights (up to 50%) than a human of the same strength without being encumbered. Any roll to avoid becoming prone is made with advantage. Fingerless. You may use your mouth as one hand and are considered small sized for sake of what you can wield or not. Butterfly Wings. You have diaphanous wings. Your base flying speed is 30 feet, and you can hover. You cannot fly if you are wearing armor you are not proficient in, armor not tailored to accommodate your wings, or a backpack not specially tailored to your wings. While flying, you have disadvantage on strength checks to interact with objects that are on the ground. Small Origins. You may shrink yourself as per the reduce function of the enlarge/reduce spell and regain the ability to do so when you finish a long rest. Pony Kin: Any effect, class specialization, feat, or item that requires or affects ponykind functions fully for flutterponies. Glowing: You can emit light from your antennae equivalent to a candle(5ft dim). You can ignite or douse this light once per turn without needing to use an action to do so. When you become small, you can harness your ancient ties to become deceptively powerful. You can shrink to small size for up to one hour. You regain the ability to do so when you finish a short rest. You can shrink to small or tiny size for up to ten minutes. When you are tiny, creatures of small size or larger have disadvantage on attacks against you, and you have advantage on stealth checks against small or larger creatures. You can do this once and regain the ability to do so when you finish a long rest. You can use your shrinking abilities to help you escape bonds. Without actually shrinking your whole body, you can have advantage on an attempt to escape bonds or a grapple. You can do this once and regain the ability to do so when you finish a long rest. Your aerial acrobatics are a marvel to behold. You do not provoke opportunity attacks when you fly out of an enemy’s reach. You can occupy the same space as an ally. You both have advantage when attacking an adjacent target when sharing a space in this way. You can use your bonus action to confer disadvantage to an enemy’s attack rolls until the start of your next turn. You can do this once and only when there is room to fly. You regain the ability to do this when you finish a short rest. With focus, you can make the dim glow of your antenna into a short lived but intense burst of brilliance. You learn the light and dancing lights cantrips. When you reach 5th level, you can cast the daylight spell with this trait, and regain the ability to do so when you finish a long rest. Charisma is your spellcasting ability for this and your cantrip spells. You can use your antenna light to distract creatures. As a bonus action, you can use a Charisma (Deception) check to initiate a contest with one creature within 30 feet. That creature must roll its Wisdom (Insight) check to contest your result. If it fails, the creature has disadvantage on attack rolls against you until the end of its next turn. You can use this ability once and regain the ability to do so after finishing a long rest.